Originally written and published for Century Guild’s blog on May 19, 2012. I’ve grown up loving art of all different eras and aesthetic movements, however, with that said, I rarely find a piece of artwork that genuinely moves me so deeply that it becomes forever emblazoned in my mind and heart. There are paintings from the Italian Renaissance, the Romanticists, the Pre-Raphaelites, the Symbolists, and then later from the Expressionists, which have managed to do this, yet most modern art seems to be so concerned with style and conceptualization, that it becomes emotionally devoid in its presentation. So, it is a very special feeling when a contemporary artist creates a piece of work that speaks to the mind, as well as to the heart, can evoke emotion, and provoke thought. Gail Potocki‘s painting, “The Repositioning of Artifice” is such a piece of work. “The Repositioning of Artifice” by Gail Potocki (2012, oil on linen). 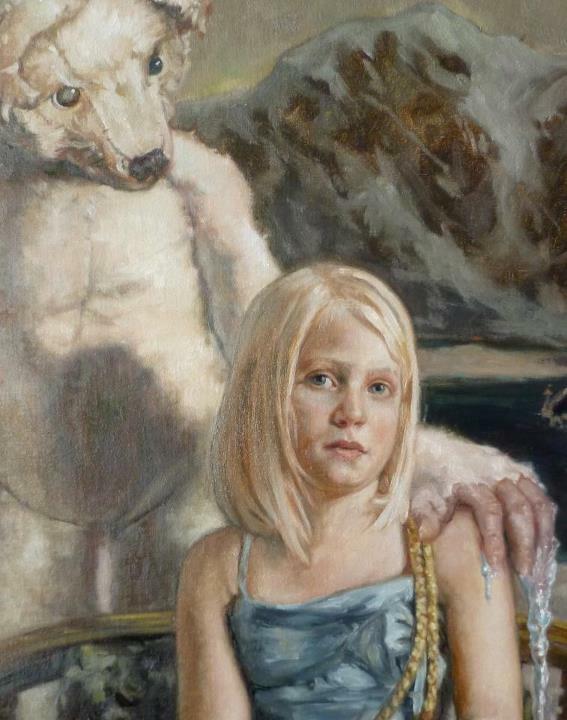 The painting was to me upon first impression, a meditation on the loss of childhood innocence and a look at the inevitability of emotional/spiritual desensitization and death. There’s a strong sense of irony and dark whimsy as the seemingly childlike toys approaching the girl close in menacingly. I was immediately reminded of Lewis Carroll‘s bizarre, fantastical odyssey in which he sent Alice down the rabbit hole and then through the looking glass on a journey of self-discovery and growth. 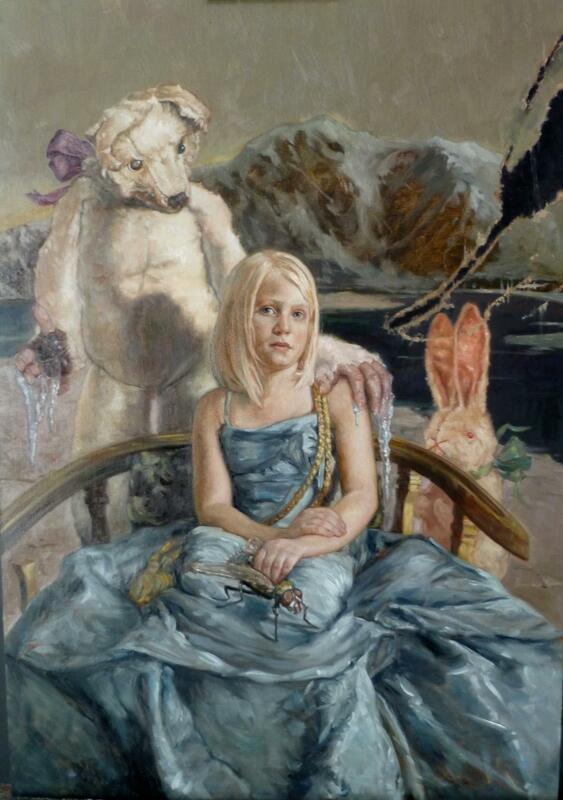 However, this was not what Gail had in mind specifically in creating the painting, and yet there is still a sense of the loss of innocence… but of nature’s innocence. Gail explained to me that the painting represents humanity’s attempt to take the natural world and to corrupt it or taint it with technology in the vain pursuit of making it better or forcing it to conform to our own selfish needs. “Initially, as I started on this piece, I was thinking about loss in terms of the natural world; and how future generations having not known what once was, will not miss what is lost. I thought of how artificial substitutes would be more real than what is or was once real. The title ‘The Repositioning of Artifice‘ refers to that idea of the artificial taking the place of the real: a toy bear, larger than life, occupying a landscape that once belonged to the real thing. And, then maybe this landscape that it is occupying isn’t as real as we think it is either (note the tear to the landscape on the right side of the painting). And so, the beauty and wildness of nature is sterilized and irreverently emulated, the animals of the wild are replaced with cheap imitations in the form of stuffed toys, and the children who inherit the earth grow up not knowing the difference between the environment outside their doors and the simulations projected coldly from their digital screens. It’s a disquieting notion and yet one that must be acknowledged. All anyone need do is look outside to see the stark contrast between what we try to surround ourselves with and what we have chosen to create. Street signs marking “Long Plains Ave.” or “Deer Crossing Blvd.” where there has been no grass or deer for over a century does make it seem like we, people, are playing a cruel joke upon ourselves. We yearn for nature at its most untamed and primitive for its beauty, but when faced with such a reality, we are humbled and fearful or see only the opportunity to harvest it and exploit it. Instead we create an alternative nature that not only pales in comparison, but which exists at our convenience and allows us to dominate it. Instead of coexistence with the natural world, we have become its warders, its prison guards, its mockingly sympathetic masters. A detail of “The Repositioning of Artifice” in which the delicate facial expression of the girl can be more closely seen and appreciated. Is she feeling numbed by the icy touch of her toy bear? Does she realize that it is the product of man’s creation and not in fact an actual bear? Is she indifferent to the artifice that exists around her or does she quietly mourn the degradation of nature’s wonders? In addition to being a very emotionally charged work, from a technical standpoint, the painting is perhaps one of Gail’s greatest achievements. The level of detail and realism (or perhaps the illusion of realism) is extraordinary in its nuance and depth. Also, Gail has done something unique here in terms of her color palette, lighting, and thematic subject matter. Normally a work of art that offers such a sense of loss and foreboding makes use of stark contrasts in light and monochromatic colors, such as seen in chiaroscuro, but Gail has effectively conveyed that same mood using cool colors and an illuminated environment, which adds to the sense of distance from reality. In the final view, “The Repositioning of Artifice“ is a modern masterpiece of symbolism. It is both a warning to us of what we still have yet to lose and a lament for that which is lost and which cannot be regained. Gail has elegantly and powerfully stated in imagery the importance of protecting not only our children and generations yet to come, but the need for preserving the natural balance of the environment and the creatures that inhabit it.